Sally Fox has been breeding and growing organic cotton since 1982. Through classical plant breeding, she’s developed varieties of cottons whose lint grows in shades of brown and green that can be machine spun. Her brown cotton varieties are as flame resistant as wool. To breed cotton that grows in color organically, one needs to be able to grow up generation after generation of offspring of the seeds made from cross-pollinating individual plants (classical plant breeding) - organically. Back in the early 1980s, Sally Fox could find no organic cotton farmers, so she began leasing land and farming her cotton breeding plots (called breeding nurseries) herself. Because the commercial cotton growers did not take kindly to her work, she had to move a few times - from Kern County to western Arizona and then finally to the beautiful Capay Valley - over the course of a decade. 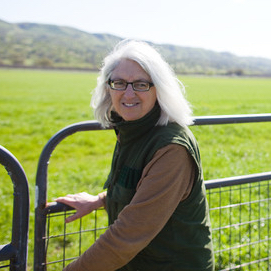 At each farm, she transitioned from conventional to certified organic. By the time she settled in the Capay Valley in the late 1990s, she had decided not to stop at Organic certification (CCOF), but to reach for the almost mythical (at least to her) biodynamic status. And since animals are a critical part of the biodynamic equation, she agreed to take sheep that were going to go to an auction, a strain of very fine wooled merinos that had been organic since the mid '80s as well.